When you’re looking for a new midsize car in Central Illinois, we think you’re going to have a hard time beating the 2015 Honda Accord. It takes everything drivers love about the 2014 model and brings it up to a whole new level. You get a fuel efficient, sporty, powerful, well-equipped car, and if that all sounds too good to be true, we can understand: you’ve likely never driven an Accord before. Honda gives these to drivers without any need to upgrade, and when you do upgrade the Accord, you find features that truly set it apart from the lower trim levels, like a satellite-linked navigation or a leather-trimmed interior. Despite the efficiency, the four-cylinder is good for 185 hp and the V6 is rated at 278 hp; Honda engineers have found a way to give you both efficiency and power, believe it or not. If you want to see whether or not an Accord is for you, the best way is to take the current model for a test drive at a Central Illinois Honda Dealer near you. 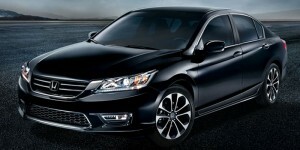 Stop by today and let one of our team members put you in the driver’s seat for some quality time with the new Accord. We think you’ll be glad you did.